Homepage. This page: Communication from an asbestos motor-car garage manufacturer back in the 1930s. The ABC asbestos-clad garage of 1935. 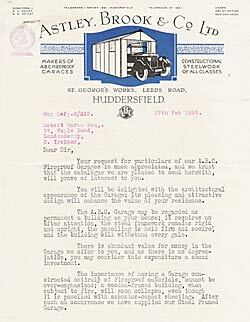 The lovely snippet of artwork shown below, is from a letter heading used by a garage manufacturer back in 1935, called Astley Brook & Co. Ltd, of St. George's Works, Leeds Road, Huddersfield in Yorkshire. Their products sold under the name of "ABC Garages". Back in the 1930s, asbestos was a fairly new wonder-material, whose health risks were (as far as I know) either not understood, or just not known about. In fact when the garages were brand new, the risk from asbestos was probably quite low. Saying that, the owner-motorist who housed his car in such a garage would be recommended not to drill any holes in the walls, say to mount shelves or brackets, as the dust could be a real health hazard. In 1935, the big selling point of these garages was their resistance to destruction through fire, at a time when many people might have had an old wooden shed or rickety outbuilding to store their car in. The company, whose literature is shown, manufactured a range of 'A.B.C. Fireproof Garages', and were obviously proud of their crisply designed creations .. "You will be delighted with the architectural appearance of the Garage; its pleasing and attractive design will enhance the value of your residence." The typewritten letter continues .. "The A.B.C. Garage may be regarded as permanent a building as your house; it requires no after attention, the steel framework remains rigid and upright, the panelling is held firm and secure, and the building will withstand every gale." Further encouragement about the benefits of these buildings ... "The importance of having a Garage constructed entirely of Fireproof materials, cannot be over-emphasized; a wooden-framed building, when subject to fire, will soon collapse, even though it is panelled with asbestos-cement sheeting. After such an occurrence we have supplied our Steel Framed Garage." "The A.B.C. Garage is approved by all Councils in the country, and, whereas most Councils insist on other types of Garages being fixed 10ft away from the house, our Garage can be fixed close to the house, and this often means great saving in the laying of an extended drive." More info about planning is given, and then the convenient delivery options that were available .. "You will note that our prices are CARRIAGE FREE, and this generally includes free delivery on to the Garage site by one of our own Motors; only in exceptional cases do we despatch by rail, and in this case delivery is free to your nearest station." Drive around some areas of suburbia even today and, usually down the side of 1930s or 1940s semis, you can still find these old asbestos/steel garages doing service, many years after first being erected. Great care must be exercised when working on these buildings, and anything that involves the dismantling of such a garage needs the services of an approved specialist. The letter shown was addressed to a gent who lived at Foyle Road, Londonderry, N Ireland - I wonder if the garage was ever ordered, and whether it remains now?? ABC Garage discovery in 2009. On our return from a walk along the local canal, we found ourselves cutting back through a '30s housing estate, and a slightly weather-worn old garage caught my eye, or rather the old cast aluminium sign screwed to it did. 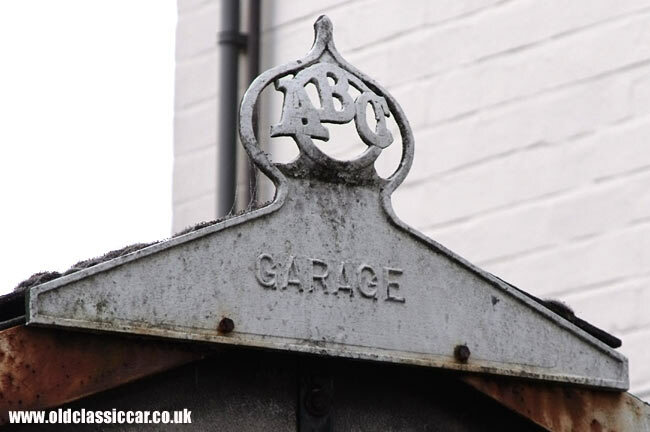 The sign for "ABC Garage" rang a bell, and a quick check confirmed that it was one of the products from Astley Brook & Co. Ltd as featured here on the site. Although the garage fell short on aesthetic beauty, this stylish nameplate is a cracking little thing, and more than made up for the garage's utilitarian look. Perhaps the site needs a section focusing on the rise in popularity of the domestic garage, or "motor house", as cars became more popular? Return to the Motoring Collectables section. If you're interested in old-style private garages like the one referred to above, please see the domestic car garages of Britain section.